Remember that time in Karate Kid when "Daniel-son" played by Ralph Macchio was at the high school Halloween dance and to get revenge on the bully kids led by "Johnny Lawrence," "Daniel-son" quietly placed a garden hose above Lawrence's head while he was sitting on the toilet getting him soaking wet when he cranked the faucet on. Afterwards, "Daniel-son" ran as fast as he could back home towards an empty field where he was about one step from scaling the fence to the South Seas apartment to make it home. At that point, Lawrence and his cronies caught up with "Daniel-son" and beat the crap out of him before "Mr.Miyagi" saved the day and then proceeded to beat the crap out of Lawrence and his gang. 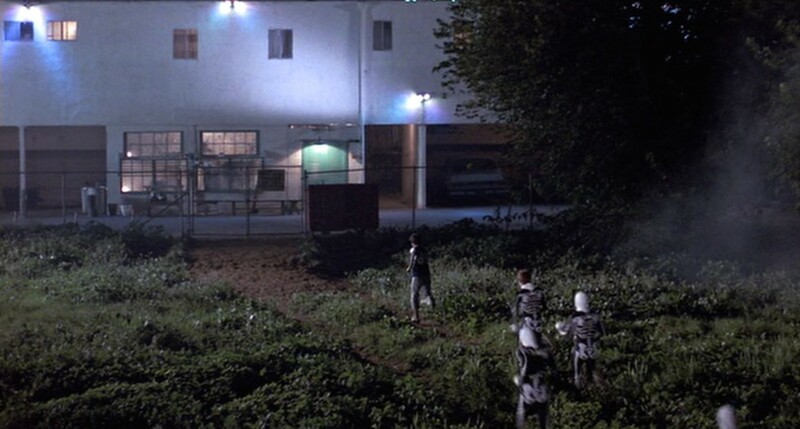 Well, that location which has long remained an empty field since at least the making of this movie back in 1984 will soon be developed. I am actually quite late on this story as a public hearing was held back on September 15, 2015 to build 16 single family home with a minimum of 2 covered parking spaces (see below). I am assuming this project will be fully approved but as of today, I have not seen any development activity. 19215 Saticoy St; 22,643 sqft vacant lot owned by Bagstad Group One LP based in Seal Beach. 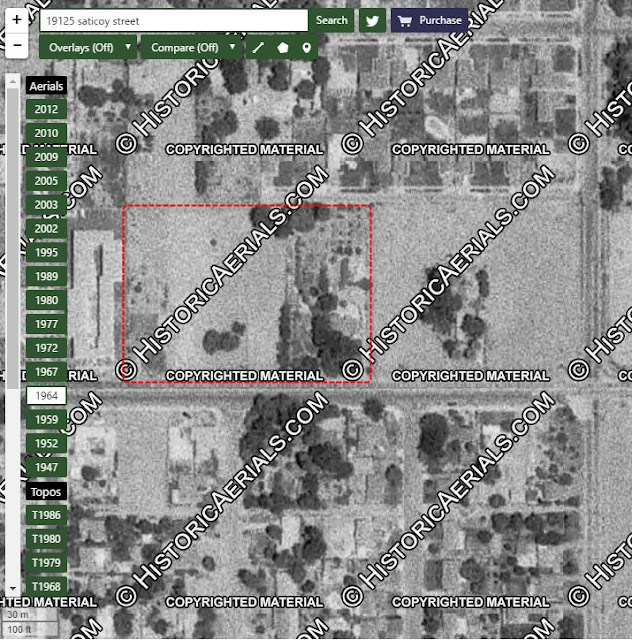 No Address (Parcel ID# 2104012026): 21,673 sqft vacant lot owned by WH Saticoy 16 LLC which acquired the property on December 26, 2014 for $1,680,000 from the Jakobovits Living Trust and Grossman Living Trust which also includes parcels #3 - #6 (more on the buying and selling parties below). 19201 Saticoy St: 21,652 sqft vacant lot owned and acquired by the same entity as in #2. 19155 Saticoy St: 21,662 sqft vacant lot owned and acquired by the same entity as in #2. 19149 Saticoy St: 21,663 sqft vacant lot owned and acquired by the same entity as in #2. 19141 Saticoy St: 21,667 sqft vacant lot owned and acquired by the same entity as in #2. The LLC links back to Williams Homes based in Santa Clarita. Another surprise during my research is that the previous owners of this land were the Harry Grossman and Jakobovits Trust who also owned that other massive open land on Winnetka and Parthenia that was sold to and is currently being developed by.....wait for it....Williams Homes that was discussed on this blog. On a historical note, it looks like there was at least one home on this propertywhere parcels #4, 5, and 6 are located. Dont know the history here but the property remained until 2005. Parcels #1, #2, and #3 appeared to always be empty. And on a related note, the South Seas Apartments sold last year for $4,250,000 on June 5, 2015 which was also discussed on this blog. Lastly, you can read about the filming locations for this awesome movie here. 2 comments to ''Karate Kid's Empty Field in Reseda to be Developed into 16 SFH's"
Two corrections to the story. Or, one correction, and one clarification. Up until about 2005 there were three homes, one each on lots 4, 5 and 6. They were used as rental properties, and in tried and true slumlord fashion, no improvements were ever made to the homes and they were left to decay until they got so bad that the roofs no longer were waterproof, and no one wanted to live there anymore. Can't imagine why. Then the owner decided they should just be demolished, rather than risk the inevitable lawsuit from the city to eliminate blight, I imagine. As far as the number of homes being built, it will be 14. This was scaled down from the original proposal of 44 homes. This was accomplished by a dedicated group of concerned neighbourhood residents of Reseda Ranch, who fought tooth and nail one bad idea after another proposed by the developer. With the invaluable assistance of Councilman Blumenfield and his staff, the final development was hammered out to be 14 homes on RS1 zoned lots, and without any guest units to be built in by the developer. Hamir, thanks for the clarifying info. Hate to see one of the last vestiges of the SFV gone but that is the reality these days.